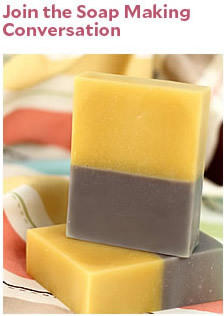 ONE: Melt 13 ounces of Olive Oil Melt and Pour Soap Base in the microwave on 30 second intervals until fully melted. 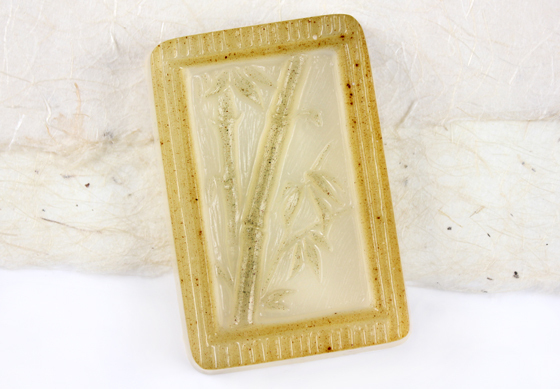 Mix in ½ oz of Fresh Bamboo Fragrance Oil. TWO: Into a separate small, heat safe container, pour out 1 oz of the melted soap and mix in 3 mini scoops of Olive Leaf Powder. Mix until there are very few clumps. Rubbing alcohol will help to break up the clumps. If the soap starts to cool down too quickly and you are unable to stir, just pop it back in the microwave for 10 seconds. TIP: Cover the remaining soap in the large container with plastic wrap. 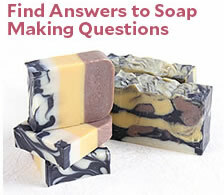 This will keep the soap warm and prevent a skin from forming on top of the soap. THREE: Use the injector tool to fill in the square borders of each cavity. 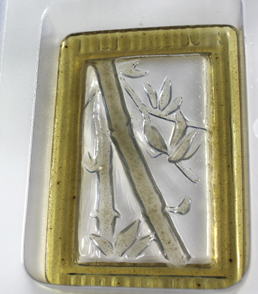 Keep the fill line low so none of the soap flows into the bamboo part of the design. But if you do get a little overflow, try using the clean-up tool or a toothpick to remove the excess soap once it sets-up. FOUR: Pour out another ounce of the clear soap and add 5 scoops of the Sea Clay. Mix well and reheat if necessary. Then use an injector to fill in the bamboo and leaves parts of each cavity. Let the soap cool. Since it’s such a thin layer it should only take 5-10 minutes. 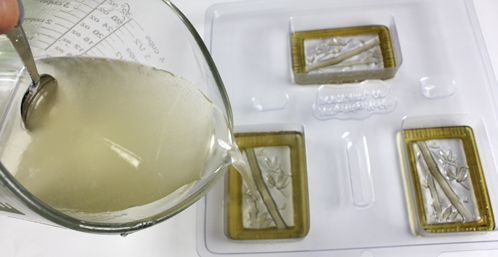 FIVE: Reheat the remaining Olive Oil soap base if necessary and mix in 4 teaspoons of Bamboo Extract Powder. Mix well until there are no clumps. 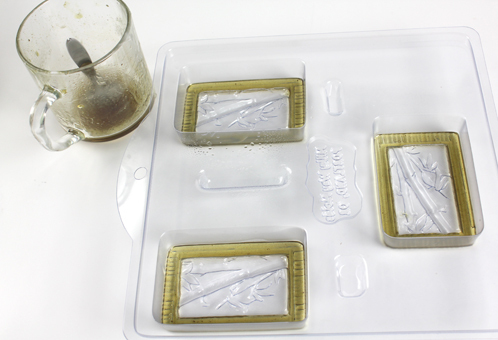 Once the soap has cooled down to 130 degrees, spray the first two layers of soap with rubbing alcohol then fill each cavity to the top. Special Bonus! Check out some unique blends that you can make with Fresh Bamboo!